Despite a relatively wet recent winter, the San Diego County Water Authority's emergency storage project is continuing at full force. One of the major components of the project, the raising of the San Vicente Dam, has been under way for about two years, and has about two more years to go before it's compete. The dam raise is included in the fourth phase of a $1.5 billion overall storage project, which was designed to provide an insurance to the region of up to six months of stored water that can be tapped in the event of a natural disaster or severe drought. The dam raise itself is a $449.5 million project, contracted through the Shimmick Construction Co.-Obayashi Corp. joint venture. San Vicente Dam, owned and operated by the city of San Diego, was 220 feet high before the dam raise project began. The raise will bring it to more than 335 feet, more than doubling the reservoir's current water capacity -- which is 90,000 acre-feet. SDCWA and the city have entered into an agreement that gives the water authority ownership of the additional capacity, while the city retains rights to the original capacity. The entire project, scheduled for completion in late 2012, will be the largest dam raise in the world using roller-compacted concrete. Refilling the reservoir after construction will take another two to five years, with most of the water being imported and purchased in non-peak months. A part of the water authority's master plan for more than a decade, the dam raise completion will come to the benefit of the region, said Kelly Rodgers, senior engineer with the water authority. "In the mid 90s, we said we need to reduce our dependency on imported water," Rodgers said. 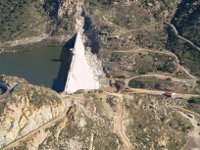 Although the dam will be filled with mostly transported water, the catch is that the additional 152,000 acre-feet of capacity will be virtually untouchable, retained for only the most serious of times. Under the agreement between the city and the water authority, all pre-raise capacity will be available for use by the city as it already is. Considering that San Diego has a history of mandatory water conservation -- with an extended period of enforced cutbacks just ending earlier this year -- Rosalva Morales, an associate civil engineer that represents water operations for the city, said the project will definitely make an impact in the driest of times. "If we have larger storage, then we have more time -- more water to use for a longer time," Morales said. "So if we do have a shortage, we'll have more ability to serve our residents than before." The larger dam will be built to withstand an earthquake of magnitude 7.5, which the water authority determined to be the maximum credible earthquake threat to the region from the closest fault systems, including the Elsinore and La Nacion systems. The landscape surrounding the reservoir contained rock well-suited to strength specifications, so an onsite quarry was mined and is being used. "It's a great benefit to us because we'll have aggregate there when we need it and we're reducing a lot of truck traffic through the community," Rodgers said. A major part of the overall emergency storage project was the construction of the Olivenhain Dam and reservoir, near Lake Hodges, which began construction in 2000 and was filled starting in 2003. Construction methods used in that project played a major role in shaping how the update to San Vicente Dam would happen. The biggest of those influences was the use of roller-compacted concrete instead of conventional concrete. Roller-compacted concrete is mixed with less water than traditional concrete, giving it the consistency of wet gravel. The method allows it to be transported by dump truck and then placed in one-foot layers, which are compacted with vibratory rollers. Current progress at the reservoir involves the construction of a secondary "saddle" dam before the actual dam raise occurs. The saddle dam will help prevent unwanted loss of water when the expanded reservoir is at peak capacity. A taller main dam means that areas not currently underwater will be in the future -- about 500 additional acres of land -- and the saddle dam will prevent water from seeping out of the vulnerable, newly incorporated area northwest of the existing dam. "It's basically to fill in topography where the water before wouldn't reach, but in the future, may," Rodgers said. When finished, the saddle dam will be about 45 feet high. In addition to the ongoing work on the secondary dam, crews have recently completed an 11-mile pipeline connecting San Vicente Reservoir to the aqueduct. The hope, Rodgers said, is to have approval on a concrete production mix sometime in August, so construction can begin on the main dam by this fall, potentially by Labor Day. That would set the concrete placing stage up for completion by spring 2012 and the synchronization of mechanical infrastructure would follow to allow for filling to begin in early 2013. The enlarged San Vicente Reservoir will also hold 100,000 acre-feet of carry-over storage water, which allows the Water Authority to store water during wet periods for use during subsequent dry years. "It's like our savings account for water," Rodgers said of the improvements. "We don't touch it on a regular basis, but there may be some occasions when we need it." What affect the project may have as far as water rates are concerned, Morales couldn't estimate with certainty, but she said if anything, it will equate to less need for constant replenishment from outside sources. "It will provide reliability," Morales said. "So it's definitely a savings as far as water purchases."